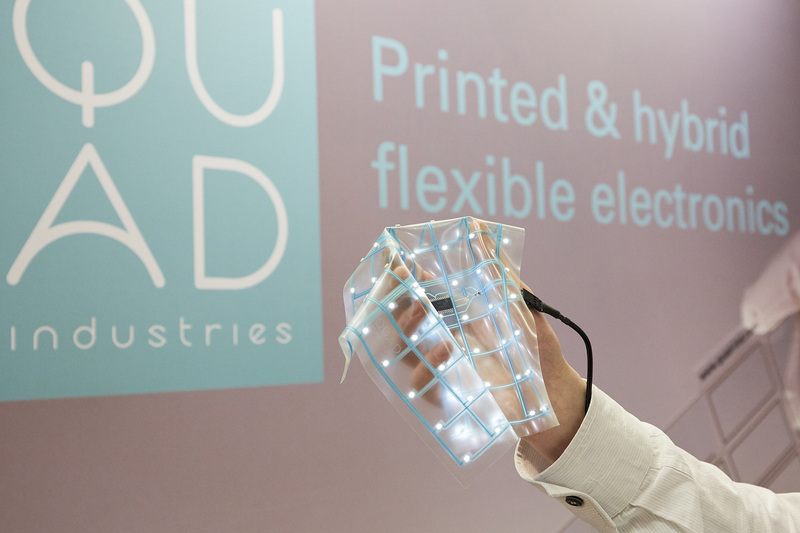 Fashion designers are expanding their range to include printed electronics. They design innovative garments that are not only beautiful and comfortable, but also think for themselves. Visitors of LOPEC 2019 will experience what is already possible today and how e-textiles are going to enrich our everyday lives in the future. The International Exhibition and Conference for the Printed Electronics Industry will take place in Munich from March 19 to 21, 2019. When winter jackets not only keep you warm but even heat up, when sports shoes record your running style and T-shirts measure your heart rate, then printed electronics is involved. Whether it is thermocouples or sensors: The electronic components produced using mass pattering techniques have meanwhile become so stable that they can withstand moisture and perspiration, mechanical stress, constant stretching while being worn and numerous washing machine cycles without damage. Therefore, it is no wonder that printed electronics is developing to become the innovation engine of the textile and fashion industry. 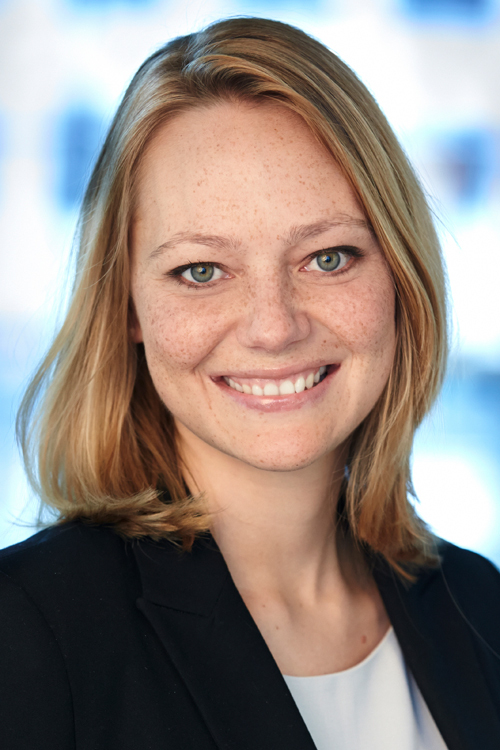 “We are picking up on the trend and focus on smart clothing and other wearables at LOPEC 2019,” says Barbara Ismaier, LOPEC Exhibition Director at Messe München. Both the exhibition and the LOPEC Conference provide information on the state of the art, application examples and the future development of printed electronics. High-tech fashion has to look good and be comfortable at the same time—therefore, rigid electronic components with complex wiring and heavy batteries are inappropriate. The designers of smart e-clothing therefore rely on lightweight, thin and flexible printed electronics. 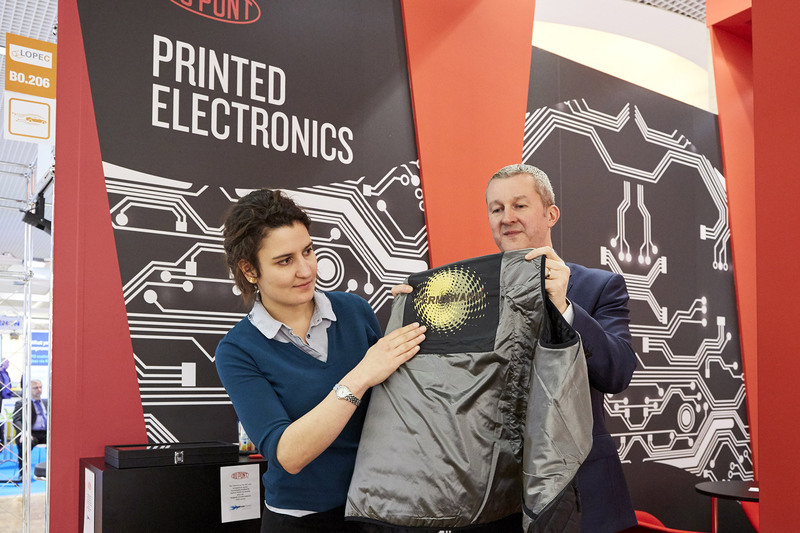 Specifically for the textile sector, LOPEC exhibitor DuPont Advanced Materials has developed stretchable, electronically conductive printing materials and flexible substrates which are commercially available under the name Intexar. The carbon and silver inks from Intexar can be used, for example, to print ultra-thin heating elements for outdoor clothing. The fashion company Ralph Lauren, for example, equipped the US team for the 2018 Winter Olympics with this jacket. Moreover, the Intexar materials are suitable for the production of sensors that measure biometric data such as pulse rate or muscle activity. Printed electronics is integrated into the textiles using standard industrial processes and can withstand up to 100 washing machine cycles. LOPEC exhibitor Quad from Belgium also proves how resilient printed electronics have meanwhile become: Together with the Dutch start-up ATO-gear, the company is developing an insole for running shoes printed with electronics. Eight pressure sensors record the biomechanical movement pattern of the foot from heel strike to rolling over. The data is transferred via Bluetooth to an app on a mobile device. The athlete receives real-time feedback and can directly improve his or her running style. The innovative soles complement the range of fitness wristbands, heart rate monitors and other wearables that athletes use to optimize their workout. The Finnish company Polar Electro, a leading manufacturer in the field of wireless electronic heart rate measurement, already introduced its first heart rate monitor in 1982. Since then, a lot has happened in the industry, also thanks to printed electronics. In his lecture at the LOPEC Conference, Dr. Jyrki Schroderus, Director Research & Technology at Polar Electro, is going to review the history of biosensory wearables and to describe his vision of the future. Korina Molla from the Spanish textile research institute AITEX is also working on visionary wearables. At the LOPEC Conference, she will present the EU project ‘Worth’ which she coordinates. The research association brings together designers, start-ups, technology companies and medium-sized manufacturers from the fashion and lifestyle scene and intends to promote a total of 150 creative projects by 2021. “Printed electronics plays a major role in the future of fashion, allowing designers to introduce new elements with flexible functionalities,” explains Molla. Wearables developed by Worth include a smart life jacket for water sports enthusiasts, a shirt that measures the curvature of the spine and helps prevent back-damaging movements, as well as a backpack with integrated theft protection. Sébastien Chaumiole and his colleagues at IBM's Watson IoT Center in Munich are dealing with employee safety. Wearables, for example, which monitor the vital parameters of people at hazardous workplaces, could minimize the number of work-related accidents and illnesses in the future. Similar monitoring systems are intended to make self-determined living in old age safer. “In addition to data protection, the wearing comfort of wearables is crucial for the acceptance of such systems. This is where technological advances in the field of printed electronics come into play,” emphasizes Chaumiole. In his plenary lecture at the LOPEC Conference, he will discuss the topics of occupational safety and smart home in greater depth and address data evaluation using artificial intelligence methods. “LOPEC covers the entire value chain of printed electronics, from material and plant development to data evaluation,” emphasizes Barbara Ismaier. For all those who would like to find out more about e-textiles already before LOPEC, she recommends visiting ISPO Munich 2019, the world’s largest trade fair for the sporting goods industry, which takes place in Munich from February 3 to 6. During the ISPO Academy, the OE-A (Organic and Printed Electronics Association), the co-organizer of LOPEC, will be hosting a seminar on “Flexible and Printed Electronics for Electrifying Sportswear”. LOPEC exhibitor DuPont Advanced Materials with their partners Real Track Systems and MAS Holding will present their technologies from 10 a.m. to 11 a.m. on February 4.